The Small, Dark Room not only sheds a light on mental health views in Asian and Middle Eastern cultures through theater, but also through art. ETD volunteer Amanda Belo spoke with curator Meredith Siemsen about the exhibit. What themes are characteristics you were looking for when conceptualizing the exhibit for the show? It’s funny, because for this particular show the artist sort of found me…With Ghaith [Jarew], I literally bumped into this very random friend of mine that I barely know and we started chatting. She mentioned that she worked at RefugeeOne, which helps find employment for refugees. Almost as she was leaving I said, “Hey you don’t happen to know any Middle Eastern artists that are looking for work?” And she said, “Actually, I do.” She had been working with this lovely man who just moved here literally 30 days previous to that from Iraq. When I initially looked at his work, what I liked about it was that he had some amazing portraits that were abstract and very colorful. But even though they were very colorful, the faces [in the pictures] themselves were somewhat subdued. You could tell there was some real depth to what was going behind these faces. Then I thought it would be so cool if he did an interpretation of the characters in the play. So I like that he has this vibrant style, but the feeling underneath, it feels like anguish and pain. Which is very pertinent to the stories. Overall, what can people expect from the exhibit particularly in relation to the play and the topic of mental health in relation to culture? Ghaith’s work will all be on easels and displayed in the lobby. He tried a variety of subjects, such as his signature style that has a lot of color. But he also has pieces that have a lot of contrast between dark and light, playing with the idea of the light at the end of the tunnel. He also ended up doing some portraits, some of which I was originally inspired by, but also others that are more abstract and raw. Emotional images that you can’t necessarily identify what it is. They are these abstract shapes that are coming together. I wasn’t really sure how that would relate to the show. And then he said, “No, they are dancing through the pain.” I just thought, wow, you can’t make assumptions about anything! I loved that it had a different meaning to him. So those are in the show and I’m excited for that. Then there is another piece, a series of three with sort of a similar feel that has musical instruments on them [see below right]. There’s a character in the show where while she was in college, she discovered the music department at her school and started hanging around in the basement just absorbing the music. 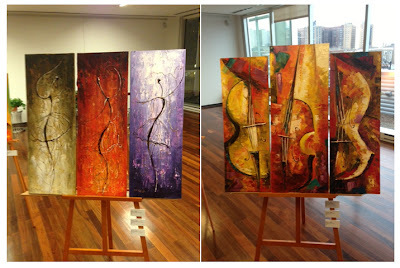 Ghaith’s piece is such a wonderful reflection on that story with the colorfulness and the instruments. Discuss your thoughts on art as a discussion starter for important issues, such as mental health, or anything else significant (i.e. social issues, political issues, global issues, etc). I feel like art is a beautiful communicator because it’s so emotional and so personal. Erasing the Distance’s mission to shed light on mental health issues through theater is such a unique approach, because we’re really putting a different face on the subject matter; one that most people haven’t seen before in a way that makes it easier for them to connect and relate. I feel like art is such a beautiful way to do something similar. To tell a story in a different way that gives someone else the opportunity to tap into, very emotionally and personally. I think it’s a very fantastic thing to do both at once. Get a little taste in the lobby then a taste in the theater. Between the two of them, hopefully the juices get flowing and people get to talking and sharing, hearts opening, compassion happening…all those connections being made. I think Ghaith’s work is so relevant, particularly with one of the stories in the show about a woman who immigrated from Iran where she faced a lot of struggle. She was jailed for protesting as a student at one point and ended up in the United States with very little resources, struggling to make ends meet and make a new start. Ghaith is walking that story right now. As an artist in Iraq, because he was an artist, a lot of his friends were Australian, American and British. In 2003 after Operation Iraqi Freedom, he was pressured to leave his home and ultimately was forced to leave Iraq or else a terrorist group was going to kill his family. So he’s not allowed back in his country. He can’t visit his friends and family anymore. He can’t go back to his homeland. His isolation and sadness is something I can’t even begin to wrap my head around. [His story] is somewhat pertinent to the courage he has as an artist and a person. So much of his work is beautiful, colorful and vibrant, but when I talk to him about it, there’s more to it than just that.